We’ve found the top destinations to visit in 2019 - from stunning beach escapes and adventure capitals to must-see foodie cities hiding in plain sight. Make it your year to travel and plan your visit to these trending destinations. Alexandra suspension bridge over Cataract Gorge in Launceston, Tasmania. Love food, art, design and nature? Then you’ll love Launceston. Surrounded by rolling hills and ancient, fern-wreathed oak trees, this boutique river city located at the head of the pristine Tamar Valley has all you need for the perfect getaway whatever the occasion. With a thriving food and wine scene set amongst elegant Georgian streetscapes, it’s pretty easy to feast all day. And when you need to work it all off head out for a hike at Cataract Gorge, or enjoy a little devil worship at Trowunna Wildlife Park. Known around the world for being the adventure capital of New Zealand, Queenstown also offers a softer side, with its emerging restaurant scene, internationally renowned golf courses and vibrant new wineries. Find a spot at the edge of Lake Wanaka and drink in the views, take a scenic plane ride over Milford Sounds, ride the Skyline Gondola or head further up the lake at Glenorchy for some stunning wilderness. A popular year round destination, there's a reason Queenstown has such an exciting reputation. Want to try some of Australia’s best food and wine? Then add Adelaide to your list. With its festivals, beaches, a thriving small bar scene and attractions like the Barossa Valley, the Flinders Ranges and Kangaroo Island close by, the City of Churches is now ideal for a weekend away or longer. Uncover its laneway secrets, marvel at the stunning flora in the Adelaide Botanic Gardens, find delicious treats at Adelaide Central Market, visit Glenelg and then taste your way through wineries in the picturesque Adelaide Hills. Rich in culture and natural beauty, the harbour city of Auckland is rated the world’s third most liveable city. And it’s easy to see why. Whether you take in the views from Mount Wellington, climb the iconic Sky Tower, sample local wine, or explore the breathtaking landscapes of Waiheke Island, Mount Eden and Rangitoto Island, you’re never more than 30 minutes away from something spectacular in Auckland. Whether it’s your first time venturing to this bay-side capital or you've worn the soles of your sneakers on its cobblestone laneways many times before, Melbourne will almost always have something new to explore. Stroll through the Queen Victoria markets, then escape the crowds with a picnic at the beautiful Royal Botanical Gardens. Love coffee? Take advantage of Melbourne’s thriving café culture and treat yourself to a pick-me-up while browsing the unique stores and museums. A coastal metropolis that hugs its harbour like a proud parent, Australia's biggest city does 'quality lifestyle' better than most. Its enviable climate, laid-back vibe and beachside culture sit comfortably alongside world-class restaurants, a vibrant arts scene and retail hotspots. 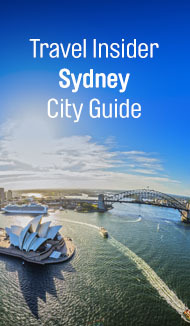 Soak in the iconic views of Sydney Harbour, The Opera House and Sydney Harbour Bridge located in The Rocks or wander along the waterfront promenade at Circular Quay. This island paradise is short hop from South Australia, but feels like a million miles from anywhere with its beautiful wilderness, native animals and untouched beaches. Nature lovers will enjoy the one of the many scenic hikes through the Flinders Chase National Park, known for its penguin colonies and coastal rock formations with endless Instagram-worthy photo opportunities to take advantage of. Follow the road less travelled and discover unique wildlife, mouth-watering food and wine, breathtaking scenery of Kangaroo Island. With its laidback, rambunctious atmosphere and bright neon lights, Osaka is the quirky and fun-loving, third-largest city of Japan. It’s also Japan’s best destination for dining. So grab your chopsticks and tuck into tasty street eats like stuffed omelette pancakes, then hit up the unpretentious, yet welcoming yakitori and udon noodle bars. You can also experience Japan’s fascinating history with a trip to the spectacular 16th century Osaka Castle, a five-layer traditional donjon. With its bustling street life, yummy food and good times, you’ll love every moment in Osaka. Discover a land before time in Broome. With ancient dinosaur footprints, rich red earth, bright turquoise waters and the fascinating Aboriginal culture, this is a place where you not only see the land, but you feel it too. Watch the camel train along Cable Beach, marvel at the wondrous Staircase to the Moon, see rare snubfin dolphins frolic in Roebuck Bay or discover the coastal wilderness of the Dampier Peninsula or the rugged red gorges of The Kimberley. Broome showcases some of the best Australia has to offer. Disclaimer: * Prices include taxes, fees and carrier charges and are based on payment at qantas.com. Fares may not be available on all flights or days. Some flights are operated by partner or subsidiary airlines. Prices are not guaranteed until payment is made. Availability is limited. Passengers booking Premium Economy may be seated in Economy on connecting flights. Check the fare rules for more details before booking. Inclusions vary between flights. All schedules subject to change, including last minute aircraft changes.